The ability of a dog to discriminate scent has long been utilized by their human to assist them in locating game, people and objects. The science associated with scent has been studied and dogs are well known to have the ability to smell scents many times better than humans. 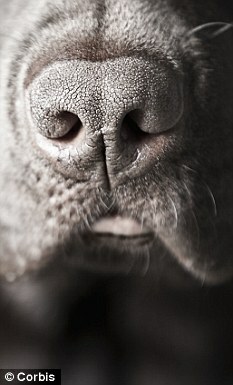 A dog’s ‘sense of smell’ is 100,000 times better than ours! Some breeds have up to 220 million olfactory receptors, versus 5 million in humans. They are able to identify and differentiate scents that are blended with many other contaminants with significant reliability.